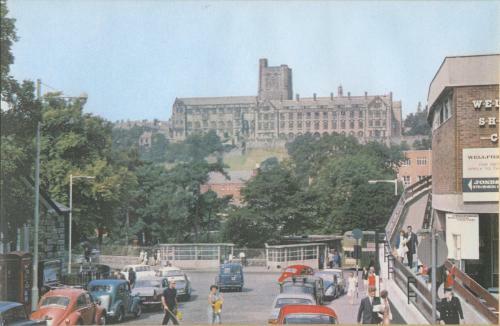 This view shows the University (University College of North Wales at the time) above the municipal bus station at Bangor; also, in the picture is the pedestrian ramp up to the car park in the ‘new’ Wellfield Shopping Centre. This photograph was taken in the 1960’s. Notice in the background, an old Crosville double-decker bus, waiting to move off.